Let’s get this out of the way: most of the smart money thinks I’m wrong by at least three years. Worldwide, according to Gartner, smartphone sales exceeded feature phone sales in 2013, for the first time — but Africa remains a different story. But wait, there may be worse news yet. The Economist last year argued that “the most dramatic, and disruptive, period of emerging-market growth the world has ever seen is coming to its close,” undercutting the increasing wealth which is the basis of smartphone adoption in the developing world. (That article is about the BRIC economies, but lower growth there → lower commodity prices → economic headwinds for sub-Saharan Africa.) And an Ericsson report (PDF) indicates that smartphone use and adoption in sub-Saharan Africa is still driven primarily by people under 30. So why do I remain so bizarrely, stubbornly optimistic? Three reasons. 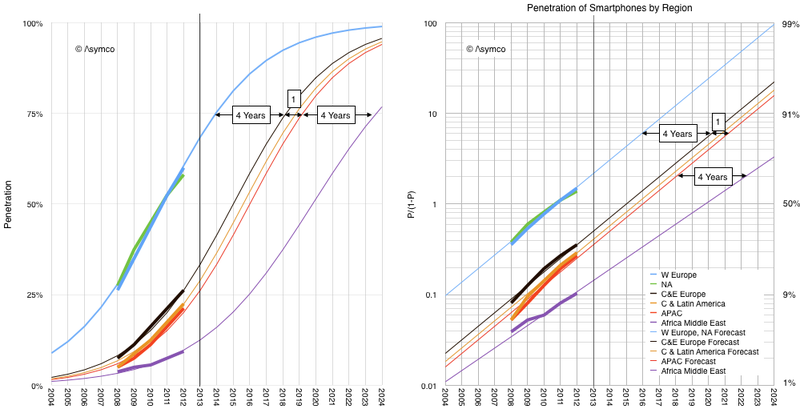 First, I’m still pretty comfortable with the argument in my original post: the available data seems to indicate that feature-phone adoption shot from 6% to 40% of the African market over a five-year period, and I still see no reason to believe that smartphones will do worse, and many to believe that they will move faster. Second, when I look at the smartphone-sales numbers elsewhere in the developing world, my eyebrows shoot upwards almost of their own accord. IDC is talking about doubling African smartphone sales after four long years? In India, they more than doubled just last year, growing a whopping 229%. Granted, India is not Africa — but I grow increasingly suspicious of the all-too-common “Africa is a special basket case” narrative. That may have been true a decade ago; that may still be true in a few disaster-zone nations; but it is decreasingly true of the continent as a whole. And finally, because (relatively) pessimistic predictions like “GSMA forecasts smartphones will constitute 20 percent of the Africa market by 2017 as devices priced at below $50 become a reality” are still being written — when, in fact, sub-$50 no-contract smartphones are already a reality today. No, really. I give you the MTN Steppa. It’s a pretty bad phone: Android 2.3.5 Gingerbread, 2MP camera, single-core processor, 480×320 HVGA screen. But it’s a genuine smartphone nonetheless, with a 3G antenna, Google Maps, Gmail, Facebook, Opera, and YouTube. And it retails for less than fifty dollars (no contract.) What happens when competing manufacturers try to undercut that? I don’t pretend to know exactly; but I do still believe that most people are underestimating the second derivative of smartphone adoption in Africa. I confess I’m tempted to back away a little from my previous prophecy, and say that in 2017, smartphones will make up the majority of African sales, rather than the installed base. That sounds like a safe bet; but I still suspect things will change faster than that that. So for the record, with some trepidation, I stand by my prediction. See you in 2017.